I’ve listened to mountains of hard rock and heavy metal in my lifetime, and feel like I’m a pretty decent judge of good music. Every now and then I hear something new that instantly gives me a different vibe, a feeling of something that is massive and monumental. And when I get this vibe, I stop what I’m doing and just listen. But with the volume of music that I listen to, week in and week out, those feelings don’t come around that often. I recently had one of those moments while listening to the new album, “Ground Zero”, from the seriously talented band, 9.7 RICHTER. Don’t get me wrong, I hear a lot of excellent music and a lot of outstanding bands, but occasionally there are those special ones that come along that are so much better than the rest, and to be perfectly honest with you, it pisses me off that I hadn’t heard of this band until now. 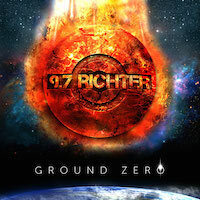 9.7 RICHTER is a “balls to the wall”, heavy metal/power metal band that absolutely needs to be heard far and wide. Hailing from Bucharest, Romania, the band consists of Cosmin Aioniţă on vocals, Adrian Rus on guitar, Lucian “Trigger” Gruia on guitar, Marius Caliman on bass, and Adrian Mihai on drums. Their instantly infectious sound is in the same vein as HALFORD and/or JUDAS PRIEST, the same style of metal that has vaulted many talented bands into the stratosphere over the last few decades. 9.7 RICHTER possesses all of the same tools as some of the greats before them and appears to be the next in line, and with the right promotion behind them, become a headliner right out of the gate. There is no lack of talent in this band. Aioniţă is obviously a Rob Halford disciple and has the talent to become a “Metal God” himself. With a vast vocal range and effortless power, this guy is for real and has the pipes to take 9.7 RICHTER to the top. Rus and Gruia on guitar are phenomenal and lay down a strong dose of power metal wizardry on every track, with true power chords and traditional heavy metal solos. They’re as good as I’ve heard in years. But it doesn’t end there; Caliman on bass is a four-string master that will command your attention from the moment you hear him and adds throbbing heaviness from the bottom end. I usually don’t get too excited about a drummer in a heavy metal band because, come on, drummers are a dime a dozen, right? Wrong. Mihai is a special talent and brings a rockstar presence to this band behind the kit. I would pay the price of admission just to watch this guy sound check. With the release of “Ground Zero”, this band has the potential to become one of the biggest bands in the world. With the same old “cookie cutter” music saturating the heavy metal genre these days, the industry needs this band to “blow up” and be the face of power metal. 9.7 RICHTER has shot to the top of my listening rotation, and “Ground Zero” is a lock to make my Top Ten Albums of 2014.